Here it is, folks, one of the key games for the Master System. For NES collectors, you have Super Mario Bros./Duck Hunt. For SMS collectors, HangOn/Safari Hunt. Clearly there was an attempt to market a game similar to the former, but how does it fare in comparison? Keep in mind that for this review's scores, I've taken both games into consideration and averaged the points. Well, to start, you have two different games here. That can always be a good thing, and I'd say, at least in concept, the idea of mixing a racing game with a shooting game is a good idea. Easy to start up and choose which one you want to play, so looks like they did a good job there. I would have preferred a proper title screen, as you see for the Astro Warrior/Pit Pot combo, but okay, whatever. So how about the games? HangOn is incredibly basic. All you do is control your bike, pass other bikes and get to the end of each course. That's it. It's as simple as it gets, and maybe a bit too simple. However, I have to say that in spite of its simplicity, I find HangOn to be a very relaxing experience. It's not the most flashy game ever, nor is it complex, but just like an older 2600 game you can easily sit down to it and just zone out. It has this strange sort-of idyllic thing going for it, if I can say that. One thing I can say, though, is that this is probably the most fluid motorcycle racing game I've ever played. The action of your rider is perfect. You don't get that wild tossing about that you see in games like Mach Rider for the NES. Still, it may be a bit too basic for some folks' tastes. And what about Safari Hunt? Unfortunately, I don't have much to say about this title that's good. First off, let's look at the concept. Safari. Okay, cool, then why am I shooting at fish and spiders? Does this make sense to anyone? I expected some rhinos, lions or what not, especially when you look at the title screen. All in all, Safari Hunt is just a bland shooting game where you fire at a bunch of targets that they seem to have randomly selected (consider that some of the animals they present don't exist in the same environments, or the same countries for that matter). That's fine, but the organization is a bit odd at times, like when you're behind this odd hill in the first round that sort-of blocks most of what could be a cool view. My main problem here, though, is concept. There is so much they could have done with this game. I imagined little natives running about, lions flying around, and leopards jumping in the trees, but all I got was a bunch of fish, monkies, and armadillos. What a cop out. It plays just fine, but I find the title and gameplay to be considerably off. For shooting games on the Master System, you're better off going with something with more of an original feel like Rescue Mission. Heck, even Shooting Gallery is awesome in its simplicity. This seems rushed to me and isn't really fun to play. No real incentive here, nor the simple joy you find in HangOn. Graphically, since these were some of the earliest titles Sega made for their new console, you can't expect too much. All in all, HangOn looks just fine, does what it should. Nothing flashy, nothing spectacular, but you can definitely tell what's what and there aren't any flicker problems or what not. The backgrounds have this serene feel to them and are just enough to give the feeling of different environments. 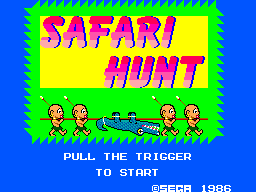 Safari Hunt opens with an awesome title screen, and for the most part the animations and designs are good. Doesn't feel like their best work, however. I mean, look at the first level alone, it looks like something throw together on an ancient paint program, the tree in the front has less detail than the clouds it seems. Other stages, such as the forest, look great. Still, in my opinion, they could have done better. The sound is pretty much nonexistent. A nice little tune for HangOn would have been nice other than the calming drone of the bikes, but oh well. 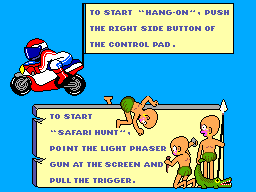 Safari Hunt definitely didn't need a theme song, but the sound effects for the animals when you shoot them is lame. It basically sounds like everything is made out of rubber because they keep throwing this odd, dull, thud sort-of sound at you. What is it? Why do fish and bears make this same sound? I have to say that Safari Hunt's opening theme is pretty awesome, however. The controls on both games are, however, spot on. HangOn is wonderfully put together, some of the most fluid controls I've ever come across. Safari Hunt is just as good, it doesn't seem to have that 'I want to put the gun to the screen so I can hit something' effect going on; you can sit fairly far away from the screen and do just fine. Good job in this category. I don't really have much of a desire to play Safari Hunt again. I have more fun with games like Shooting Gallery and Laser Ghost than I do this. There are plenty of better Light Phaser games for the SMS. You probably won't sit with it for too long. 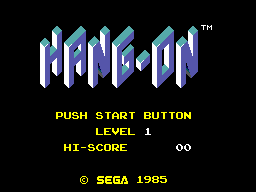 HangOn is, however, a game I've come back to on a number of occasions. It has this nice, calming atmosphere to it. Easy to play the first time, and easy to play any time. Sometimes you need a game like that. I think Sega could have done a better job with their choice of pack-in. They would have probably struck gold if they did some sort of Alex Kidd in Miracle World/HangOn pack, which in my opinion would have blown Super Mario Bros./Duck Hunt out of the water, or at least would have been good competition. Still, it's the pack-in we SMS fans have to contend with and overall, considering both games as a whole, it's not all bad, there's some good to be found.